Dressage rider Laura Graves sharing a laugh with her horse, Diddy. 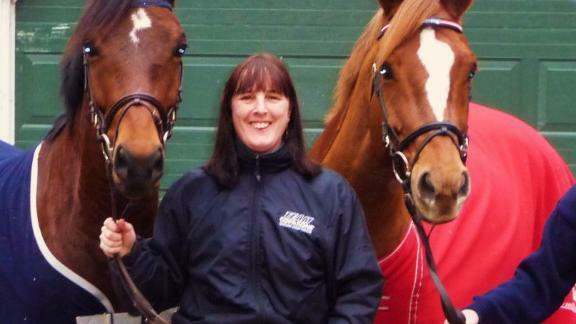 Laura Graves wanted to work with horses since she was a child, but her parents insisted she pursue another profession in case things didn't materialize as she had hoped. "I'm the type of person that when I start something, I either decide I don't like it right away or I become very serious about it right away," said Graves. "Riding was the latter." 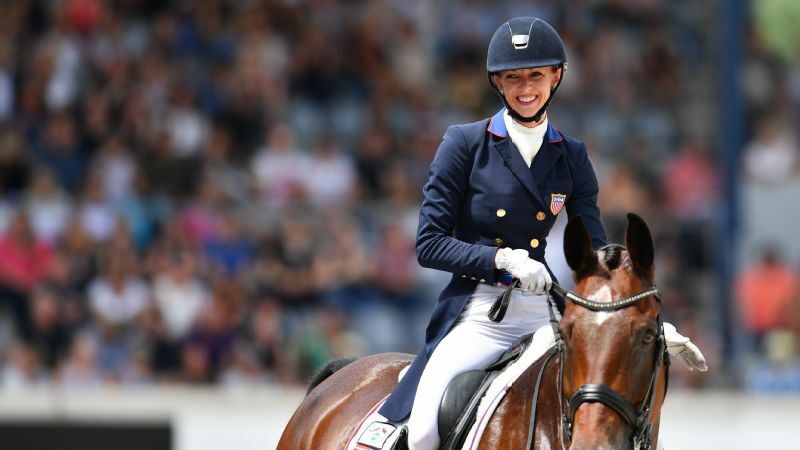 Little did she know that her detour into cosmetology would benefit her as a full-time trainer and a member of the United States equestrian team. Graves learned the art of reading people while working in a Spa in Vermont and later Boston. She's now transferred that skill to her horses. "It's very similar in the way that every single one of them is different," said Graves, who won a bronze medal in the team dressage competition in her first Summer Olympic Games in Rio de Janeiro in 2016. "It comes down to personality. It's important to understand how they're different, what they're trying to say and what they need from me to do their job." 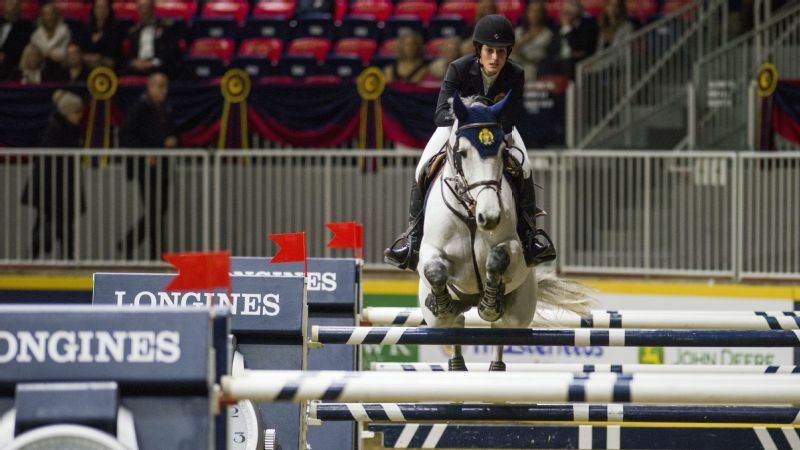 This week that job for Graves and her 16-year-old Dutch Warmblood formally named Verdades, but better known as Diddy, is the FEI World Equestrian Games. Over three days, the duo will compete in three dressage events in Tryon, North Carolina, including both a team event and individual competition. There's also the Grand Prix Special, a test of everything the horse knows with each rider performing the same program, and the Grand Prix Freestyle, which is when a routine is choreographed to music. Graves' horse was one of four on the team transported from their Orlando, Florida home to North Carolina via a commercial hauler the weekend before the competition. If the journey had exceeded 12 hours, the horses would have been placed on a cargo plane, something that has now become "pretty common." In dressage, a sport involving the execution of precise movements by the horse in response to barely perceived signals from its rider, appearance is just as important as performance. And once again, Graves' cosmetology training pays dividends. She braids Diddy's mane with strings instead of rubber bands, so they're woven into the hair. Automatic clippers are used when hair needs to be trimmed instead of the expensive scissors owned by hair stylists because "they don't last long in a barn." The 31-year-old Vermont native also has found that when grooming Diddy, the lessons she learned in cosmetology are relevant because his "hair and skin are the same." For that task, her favorite product is coconut oil. "I find that organic coconut oil cures a lot of conditions," Graves said. "I take a little bit, rub it in my hands and then rub it on his face. If he has dry and itchy skin ... from the amount of soap that we use, I will sometimes melt the oil in warm water and sponge that all over him. That helps moisturize his skin and makes him nice and shiny, too." Graves and Diddy have come to understand each other's personality. They were acquainted in 2002 when Diddy was a 3-month-old foal. The nickname was assigned to the horse because he was "itty and bitty." Graves' parents purchased him for her when her first horse, Sunny, was retired from competition. The family's 30 acres provided a perfect environment for Diddy to grow. The relationship between equine and rider is quite intimate. 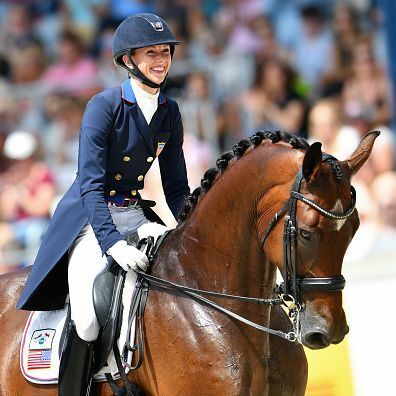 Graves describes herself as "very organized, detail-oriented and focused on being able to communicate" with her horse, which is why dressage appealed to her. And Diddy was "unlike any horse I'd ever met." "It was a real learning curve to understand each other's personalities," said Graves, who began riding at 10 years old. "He was completely transparent, totally honest. He was very, very sensitive. "Once you understand him, then life is pretty easy. But if you try to make him behave like another horse, or you tell him that he's wrong, it doesn't go over so well. You have to appreciate him. If you listen to him, you will get back more from this horse than you will ever get back from another horse." Graves notes the daily training for a horse is different than for a human because it can't continue for several hours. "You can't put that kind of pressure on them, mentally or physically," Graves said. "The horses are only training -- depending on the horse, the weather and the day -- anywhere from 20 minutes to 45 minutes maximum. The rest of the day is spent managing them, walking them and making sure that they are perfectly cared for." Always being in top physical shape is essential for both horse and rider, and Graves admits that sometimes that's more difficult for the rider during a competition. "We spend so much of our energy taking care of the horses ... that we tend to put ourselves second," Graves explained. "During the Games, we have to make sure that we're getting our protein and we're hydrating. We're very lucky that we have a team doctor who looks after us." When Graves isn't competing, she's a full-time trainer in Orlando. She works with no more than eight horses daily, giving them personal attention and nicknaming all of them once she learns their personalities. It was being able to communicate with horses and her love for them that initially drew her to them. "I found them intriguing; how smart they were and how much you could teach them," Graves said. Deb Williams is a North Carolina-based writer and former editor. She has been a journalist for more than 30 years.